How does Youth Progression work? USTA Colorado will track both participation (stars) and achievement (trophies) for players (ages 7-10) who compete in sanctioned tournaments or in Junior Team Tennis. Players and parents can easily track progress through the pathway by logging on to the Player Profile Page. Access the Player Profile Page by clicking the “My Tennis” tab on the bottom of the Profile page. Enter the players USTA number and password to be directed to the players welcome screen. This screen will allow the player to access various items including his or her “Youth Progression Progress Report”. Progress is displayed as “trophies” for achievement and “stars” for participation. This helps players, parents and coaches track progress and find upcoming play opportunities that fit a players age and skill level. If desired, the player can upload a photo to his/her player profile page by clicking “Manage Account” directly under the players USTA Account number in the top right corner of the welcome screen. Players only earn stars and trophies for progression (“tagged”) events in which they are eligible. As players advance, they will see how many more stars and trophies they need to acquire in order to reach the next level. Where do the points (stars and trophies) come from? Points will be accumulated through two programs — Junior Team Tennis and Sanctioned Progression Tournament play. How (and when) does my child advance? Players and parents will receive e-mails with progression updates, and players can track their progress via TennisLink. In Colorado, players 7-10 years old begin in the Orange level. 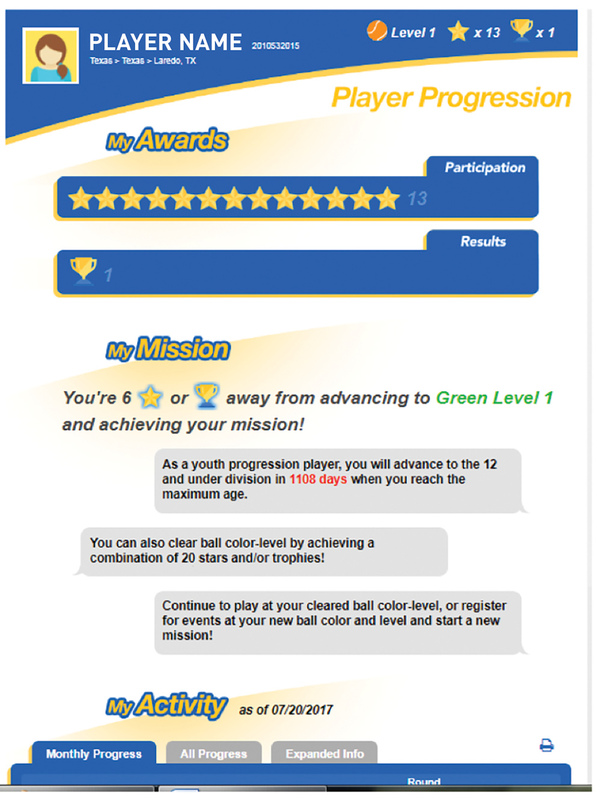 Players earn “stars” and “trophies” worth 50 points each, with players needing 1,000 points, or a combination of 20 stars and trophies, to advance to the Green level (a traditional 78-foot court with a Green ball). If they accumulate 1,000 points (or 20 stars/trophies), they can advance to the Yellow level. But players have the choice on whether to advance on points. They can opt to remain at the Orange or Green level until they automatically progress out of the system on the first day of their 11th birthday month. Progress updates will be published weekly, and emails will automatically be generated by the system to alert kids/parents who have advanced to a new ball level. Players will also occasionally receive emails with encouraging status updates.